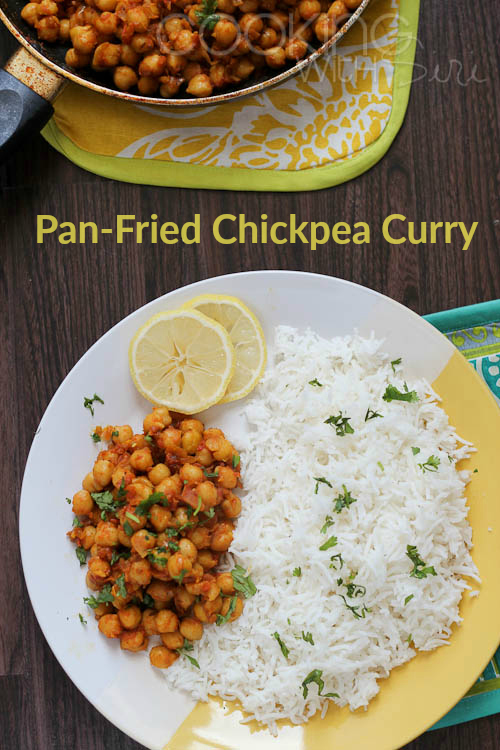 A quick and easy recipe for chickpea curry - pan fried and lightly coated with spices. Perfect as a side dish for rice/roti or as an easy snack with crunchy chips. Indian food is not hard at all and this dish is the proof. Among the zillion varieties of beans (legumes) we have, I am very partial to chickpeas and red beans. They were the first legumes I tasted and my childhood is littered with many memories with them. 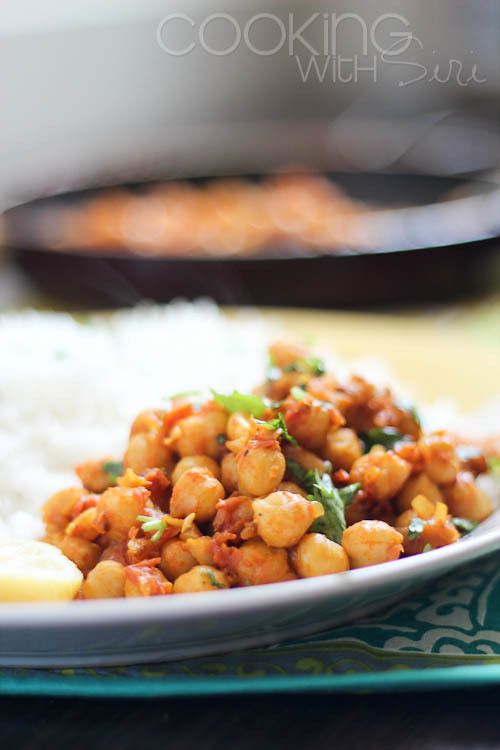 Today's recipe Tawa Chana (Pan-Fried Chickpeas Curry) is adapted from India's most celebrated chef Tarla Dalal whose recipes inspire me even to this day. Made with simple ingredients, this dish tops my list of healthy recipes and it's a cinch to make. I like working with dried beans but if you wish to, just use canned beans. I ate it with rice as a side dish and it can also be served as an easy snack paired with crunchy chips, few cut raw onions and a lemon wedge. And you know, where else you would commonly see this dish? On many road side chaat-wallahs, who make in ginormous proportions every day and mix with everything from potato patties (ragda patties) to samosas to crispy papdi. Heat oil in a pan and once it is hot, add onions. Saute on a medium flame for 1 to 2 minutes. Add all the spice powders: chilli powder, green chilli, turmeric powder, cumin powder, chaat masala, garam masala, dried mango powder and 2-3 tbsp of water. Mix well and cook on a medium flame for 1-2 minutes, while stirring continuously to make sure they don't get burnt. Add chopped tomatoes and give it a stir. Rub dried fenugreek leaves between your palms to release the oils and add to the pan along with chickpeas and salt. Add a few tbsp of water if needed. Mix well and cook on a medium flame for 4 to 5 minutes. Garnish with coriander leaves and serve hot with rice, roti or as a snack. This recipe joins July Week # 3 of Cooking from Cookbook Challenge Group. Also to My Legume Love Affair # 97 guest hosted by Kalyani and managed by Lisa. 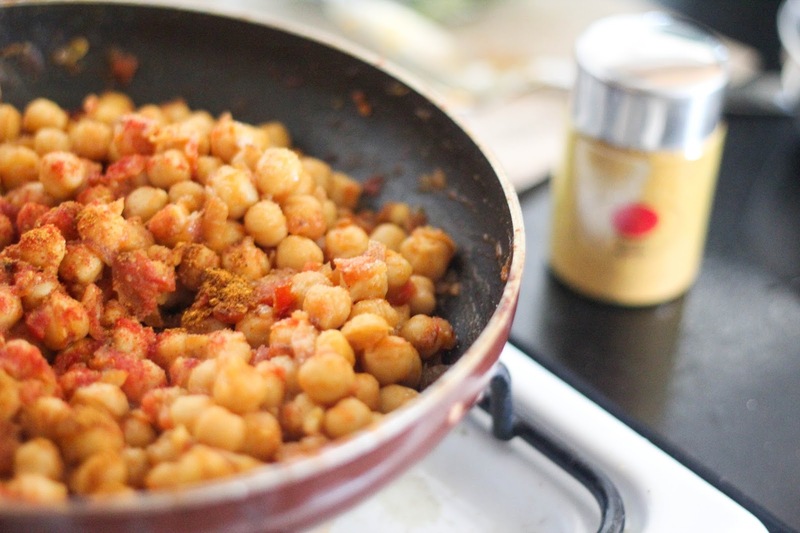 I too love chickpea and anything with it is a favorite..lovely pictures.. I read this post when I was hungry and then I died.